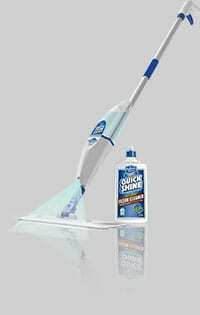 Quick Shine® durable, lightweight, swivel head mop with extendable pole for comfort and easy storage. 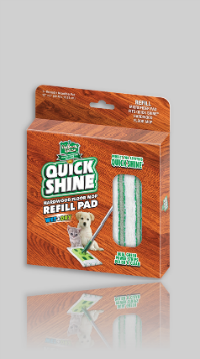 Quick Shine® washable, dual zone microfiber cleaning pad grabs and locks allergens, pet hair, dust and dirt. Use damp to apply our Quick Shine® Floor Finish or Quick Shine® Hardwood Floor Luster; use dry to dust. Environmentally friendly reusable pad. Washable. For best results, use one pad for cleaning and one pad for finishing. Always rinse pads thoroughly after use. 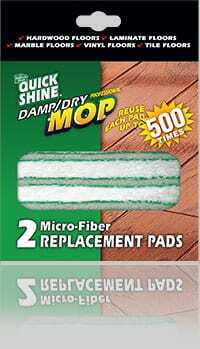 Thick, reusable microfiber mop pad to use damp or dry with our Quick Shine Hardwood Floor Mop. 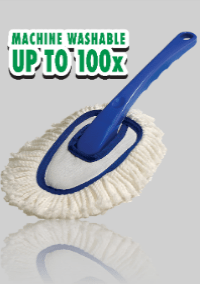 Machine washable up to 100x. For best results, use different pads for cleaning and finishing. 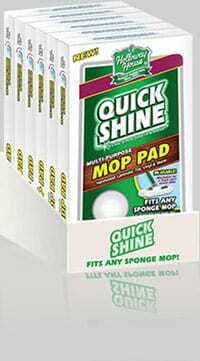 Re-usable, thick, wide microfiber pad for use with Quick Shine® Spray Mop. Washable. For best results, use different pads for cleaning and finishing. Restores the richness, color, and beauty of hardwood floors. Fortified with pure, natural, plant-based carnauba to coat and protect for added durability. Advanced technology, water-borne polymer keeps high-traffic hardwood floors beautiful. R/O Water (7732-18-5), Styrene Acrylic Polymer (proprietary), Tri-2-butoxyethyl phosphate (78-51-3), 1,2-Propanediol (57-55-6), Polyethylene/Polypropylene Emulsion (proprietary), Carnauba Wax Emulsion (proprietary), Dipropylene glycol monomethyl ether (34590-94-8), 1,2 Benzisothiazolin-3-one (2634-33-5), Fluorinated Polyether (proprietary), Silicone Emulsion Antifoam Agent (proprietary). Protects and shines hardwood, laminate, vinyl, tile, and stone. R/O Water (7732-18-5), Acrylic Polymer (proprietary), Polyethylene/Polypropylene Emulsion (proprietary), Tri-2-butoxyethyl phosphate (78-51-3), 1,2-Propanediol (57-55-6), Dipropylene glycol monomethyl ether (34590-94-8), 1,2 Benzisothiazolin-3-one (2634-33-5), Fluorinated Polyether (proprietary), Silicone Emulsion Antifoam Agent (proprietary). Cleans floors easily leaving no hazing, streaking, or sticky film behind. Made for use in our Quick Shine Spray Mop. No rinsing needed, dries fast. Ingredients: R/O Water (7732-18-5), Ethoxylated alcohols, C10-16 (68002-97-1), Ethoxylated alcohols, C9-C11 (68439-46-3), Sodium Bicarbonate (144-55-8), Fragrance (proprietary, see http://www.ifraorg.org/), 1,2 Benzisothiazolin-3-one (2634-33-5), Polymeric blue colorant (proprietary). Designed specifically to clean hardwood floors in high-traffic areas. No hazing, streaking, or sticky film left behind. R/O Water (7732-18-5), Ethoxylated alcohols, C10-16 (68002-97-1), Ethoxylated alcohols, C9-C11 (68439-46-3), Sodium Bicarbonate (144-55-8), Fragrance (proprietary, see http://www.ifraorg.org/), 1,2 Benzisothiazolin-3-one (2634-33-5), Polymeric blue colorant (proprietary). Easy cleanup for little spills. Advanced Smart Clean Technology specifically made for hardwood floors. Cleans without leaving streaks or residue. Dissolves dirt and eliminates grime from hardwood, laminate, tile, vinyl, and stone. Leaves no sticky or oily residue. R/O Water (7732-18-5), Alkylpolyglucoside, C8-C10 (68515-73-1), Alkylpolyglucoside, C10-C16 (110615-47-9), Ethoxylated alcohols, C10-16 (68002-97-1), Ethoxylated alcohols, C9-C11 (68439-46-3), Sodium Lauryl Sulfate (151-21-3), Sodium Xylene Sulfonate (1300-72-7), Fragrance (proprietary, see http://www.ifraorg.org/), 1,2 Benzisothiazolin-3-one (2634-33-5), Citric Acid (77-92-9), Polymeric blue colorant (proprietary). Simply spray and wipe for life’s little spills. For use on hardwood, tile, vinyl, laminate, and stone. Advanced Smart Clean Technology cleans without leaving streaks or residue. Safely remove old finishes and wax, or deep-clean tile grout. Covers approximately 500 square feet. Has no noxious fumes. Removes newer polymer finishes. Safe to use wherever water is used for cleaning. Highly refined natural oil deeply moisturizes and preserves wood for a rich, natural glow. Formulated with sun-guard to prevent fading from daylight and direct sunlight. Also removes soap scum and water spots from tile, shower doors and stainless steel. Easy-squeeze squirt bottle. Biodegradable, gentle formula with orange fragrance. No harsh detergents or abrasives. Can be used on your hands and natural surfaces such as wood and leather. Waterless, natural cleaner for fine wood. Cleans and protects. Gently dissolves wax buildup. Deep-cleans dirt, cooking grease, smoke, and body oils which can darken and soften wood. Easy-squeeze squirt bottle. High-quality concentrated formula cleans and deodorizes, leaving a fresh, clean smell. households since 1927. Made in the USA. Removes tough stains from permanent-press fabrics such as tablecloths, sheets, uniforms, etc. Removes set-in stains from everyday laundry. Safe for cleaning all fine washables such as silk, cashmere, etc. Cleans, shines and protects kitchen appliances, BBQ grills, countertops, metal decorative trim, drinking fountains, metal fixtures, and aluminum and metal furniture. Removes tough soil, smudges, stains, oil, and fingerprints. Leaves a high-gloss shine with no streaks or residue. Protects with a thin coating to resist further soiling. Non-abrasive formula. Removes dirt, grease, and dull waxy buildup to bring out wood’s natural beauty. Cleans, conditions, and protects. Protects against stains, water spots, fading, and cracking. Leaves a deep, rich shine with no streaks or waxy buildup. Eco-friendly formula contains no ammonia. 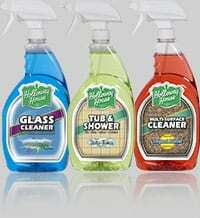 Cleans and shines glass, mirrors, sinks, countertops, and other washable surfaces. Can also be used as a light-duty cleaner on all surfaces not harmed by water. Ready-to-use and requires no rinsing. Calming tropical island fragrance. Quick clean-up of routine soils from walls, granite, Formica, and most solid surfaces in your home. Non-toxic and biodegradable. Try all three of our new eco-friendly fragrance-enriched spray-and-wipe cleaners and save 33%. One Holloway House Glass Spray Cleaner 32 oz. One Holloway House Tub and Shower Spray Cleaner 32 oz. One Holloway House Multi-Surface Spray Cleaner 32 oz. 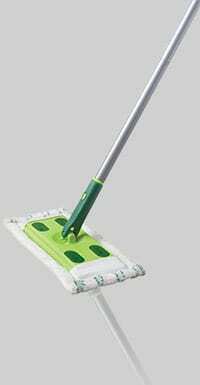 Thick, reusable microfiber mop pad to use damp or dry. Fits any sponge mop. Reusable, washable microfiber dusting pad. Soft enough for any surface. Attracts and locks in dirt, dust, pet hair, debris, and bacteria. Use on shelves, counters, blinds, windowsills, furniture, and more – even your car’s dashboard. Re-usable microfiber pads designed to fit our discontinued two-pad microfiber mop. 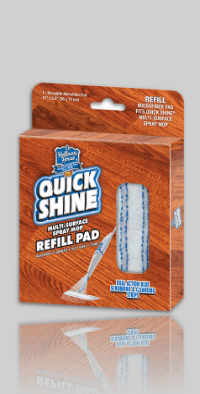 Note: these pads will not fit the Quick Shine® Hardwood Floor Mop. Currently Out of Stock. New Inventory will arrive 04/01/19! Penetrates tight weave of area rugs and carpets. Non-corrosive, butyl-free formula. Reduces allergens while it cleans. Easy to use. Simply spray and allow 3-5 minutes to break down stain. Deodorizes. Removes coffee, blood, urine, wine and other tough stains. Cleans hardwood, laminate, tile, vinyl and stone floors. Will not reduce the rich glow of Quick Shine® finishes. Made in the USA. Removes footprints, pet stains, and spills for everyday cleanup. Buffable wax. Will not yellow light floors. For vinyl, asphalt, linoleum, rubber, terrazzo or sealed wood floors.